Bring home this three piece 607 sectional sofa set which is perfect for any kind of living room as it will perfectly compliment your home décor. The sofa set is so compact and unique that it will solve your space problems. This sofa set contains a sofa, chair and the love seat that will add style to your living room. The solid wooden frame and the transitions used in the design is the highlight of this sectional sofa. Superior quality construction will make this a wonderful selection. Wooden legs make this set more durable. Imported fabric helps to make ultimate style statement. Handcrafted carvings are very impressive. 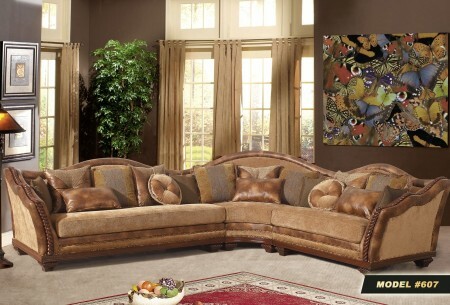 The 3 piece sectional sofa set will give you the ultimate comfort and style that you always wanted.